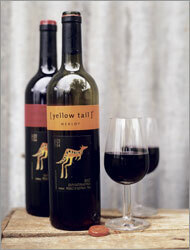 By the end of 2001, 225,000 cases of Yellow Tail had been sold to retailers. In 2002, 1.2 million cases were sold. The figure climbed to 4.2 million in 2003 — including a million in October alone — and to 6.5 million in 2004. And, last year, sales surpassed 7.5 million — all for a wine that no one had heard of just five years earlier. Do you notice the negative leading coefficient of the x2 term? Remember how this makes the parabola “frown”? Well, this “inverted parabola” shape clearly reflects the flattening of the sales growth.